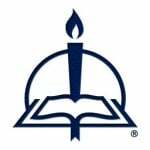 by Steven L. Ware, Ph.D. 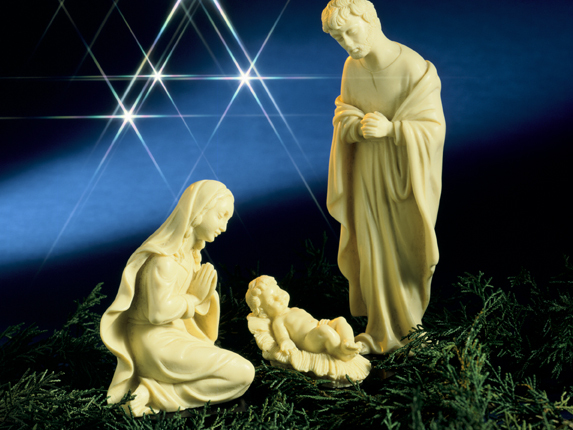 Indeed, in our modern post-Christian society, matters concerning the birth of the historical person Jesus and Christian claims about the uniqueness of the circumstances of his birth are often relegated by a secular public to the realm of faith and myth— widely respected, yet also widely disrespected and ignored. Even though many churches typically see their largest crowds of worshipers on Christmas Eve (or on Easter Sunday), a large percentage of their neighbors are just as happy if no religious meaning at all is attached to what is otherwise a holiday full of feasting and materialistic pleasures. Yet the truth of the matter is that there is no reason for modern Christians to retreat on this matter—to practice anything less than a public proclamation of the divine deliverance from sin brought by the Messiah Jesus. Indeed, Christians have been celebrating Jesus’ birthday—usually on December 25—since at least the fourth century. In fact, the earliest known citation of December 25 as the birth date of Jesus comes from the early third century in the Commentary on Daniel (4.23) by Hippolytus, where he stated that Christ was born on the eighth day of the kalends of January—which by Roman calculation is December 25—and that it was a Wednesday. A popular theory of more modern vintage is that December 25 was chosen as the birth date of Jesus in the late Roman era by Constantine I and his successors—who sought to use Christianity as a galvanizing force in Roman society after a period of civil wars. They allegedly chose this date because it was directly after the historic pagan celebration of the birthday of Saturn, or “Saturnalia” (celebrated at the Winter solstice, usually December 17-23). While this theory possesses several glaring weaknesses, the most important thing to note is the evidence coming from the several ancient Christian writers who give us the earliest input on Christian celebrations of Jesus’ birth. Quite tellingly, none of them ever mentions Saturnalia in connection with Christian celebrations of Jesus’ birth or in connection with the date of December 25. Consequently, we have no hard evidence that early Christians even engaged in discussion about the replacement of Saturnalia by Christmas—which surely would have been a notable development, and would have elicited spirited discussion among them. But what about December 25? Is it really the birth date of Jesus? And if so, how do we know? While Scripture itself gives only a few historical clues to the year of Jesus’ birth, it is equally non-specific concerning the month and day of his birth. In addition, the vast majority of early Christians were common folk with no noble rank or high level of education. So we would hardly expect to see highly developed and rigidly scheduled worship traditions among them other than those they inherited from their predominantly Jewish heritage. Yet in less than two centuries after the lifetime of Jesus—when Christians were still a small sect meeting in homes and intermittently persecuted by Roman authorities—they were known for annual celebrations of Jesus’ birth. And before many years had passed the overwhelmingly common date for that celebration became December 25. But why December 25, especially if it had nothing to do with Saturnalia? It is not because of the date itself, but because of its relationship with another date nine months previous—which in this case is March 25. It was stated perhaps most clearly by Augustine (354-430) of Hippo, who asserted not only that Christ is believed to have been conceived on the 25th of March,” but that it was “upon [this] day he also suffered,” and later that “He was born, according to tradition, upon December the 25th.” Another example is found in the Canon of Hippolytus, where he specifically associated March 25 with the beginning of creation, and in one place even with the date of Christ’s birth. In the minds of many ancient peoples, including the Romans, March 25 was the vernal equinox (beginning of Spring), and was therefore viewed as the beginning of a new year. Many ancient peoples also understood the vernal equinox as marking the day of creation. In other words, the vernal equinox reflected the creation as it was at the very beginning—fresh from the hands of God, with all things in balance, and moving into the season of nature’s production. So for early Christians it only made eminent sense that God would likewise begin the re-creation of a redeemed humanity through the incarnation of his Son in human form on the same date. An alternate way of understanding this (and, in the mind of this author, more theologically defensible from a Judeo-Christian viewpoint) is to assert the possibility that the incarnation of Christ occurred on the Jewish feast of Passover—which was March 30 in 3 BC, the most likely year of Jesus’ birth. Although a few days after the date of the vernal equinox, placing the incarnation on Passover provides a more theologically grounded date for the beginning of the earthly life of Christ, since he was likewise crucified on Passover thirty-five years later. What could possibly be any more theologically and calendrically appropriate, since March 30 is still essentially nine months before the assumed date of his birth on December 25? More information on this and related topics can be found in When Was Jesus Really Born? 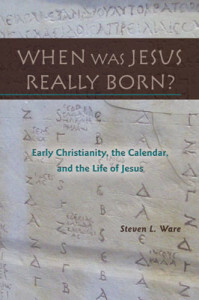 : Early Christianity, the Calendar, and the Life of Jesus (2013), and on the author's website http://www.wheresware.weebly.com.